Air-Tec G2 is a multipurpose multi-use grease design to fulfill and exceed the most common greasing applications. So whether you are a homeowner, hobby farmer, farmer, or own heavy construction equipment it is ready to get to work for you! 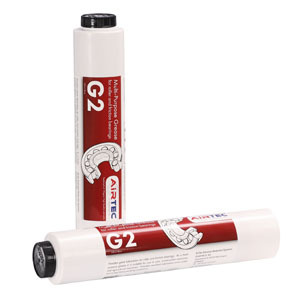 AirTec G2 Multi Purpose is a lithium based grease and has good water resistance and pressure resistance. Made with a thinner base oil it is ideal for use at low temperatures as it will remain thin and easy to pump! Ideal for wheel bearing and friction bearing lubrication. Contains anti-oxidants and corrosion inhibitors to provide excellent resistance to oxidation and corrosion. Specialized polymers also help the grease stick to the surface so that under stress or pressure the grease remains in place and continues providing lubrication.